Former Vice-President Joice Mujuru who now leads the National People’s Party is down but not out. 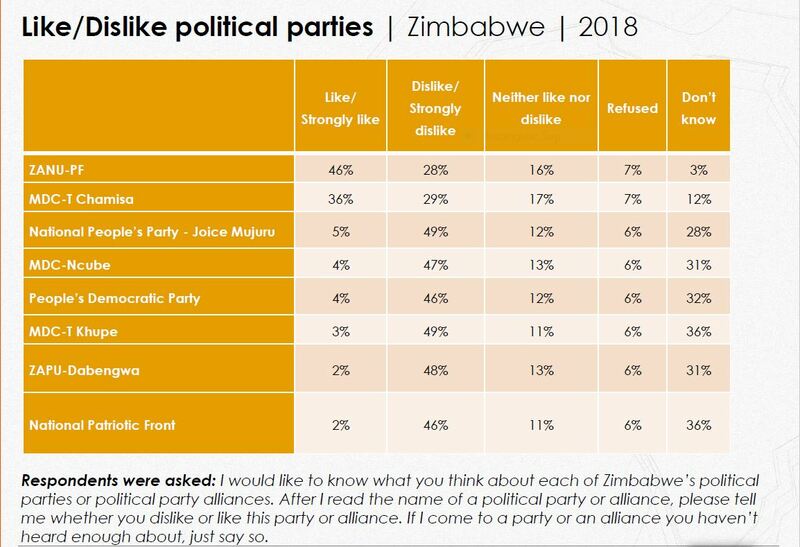 Her party is the third most popular party after the Zimbabwe African National Union-Patriotic Front and the Nelson Chamisa faction of the Movement for Democratic Change, according to the latest poll by Afrobarometer. The poll was conducted from 28 April to 13 May this year. But while ZANU-PF commanded 46 percent of the vote with Chamisa’s MDC-T at 36 percent, Mujuru’s NPP was way down at 5 percent. Surprisingly Thokozani Khupe’s MDC-T is more popular than Dumiso Dabengwa’s Zimbabwe African People’s Union, while the party that has been promising to topple President Emmerson Mnangagwa because he came to power through a coup, the National Patriotic Front, ranks at the bottom. But among the opposition coalitions, Mujuru’s coalition, the People’s Rainbow Coalition ranks at the bottom with only 16 percent knowing about its existence. Elton Mangoma’s Coalition of Democrats has 17 percent while 57 percent know about the MDC Alliance.